Joseph & the Amazing Technicolor Dream Coat is an entertaining interpretation of the biblical tale of Joseph in his journey that leads to his rise as the trusted advisor to Egypt’s king. 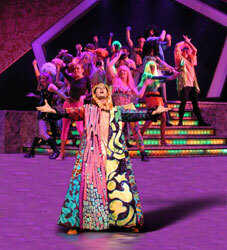 Entirely told through song and dance, the musical is the newest production of Miracle Theater. This masterpiece from celebrated duo Andrew Lloyd Webber and Tim Rice opened in Broadway in 1982 and has since been rendered in many blockbuster productions across the globe. Its story is one of the most popular tales in the Bible, which features Jacob and his twelve sons. Among his children, Jacob favored Joseph more than the rest. This evoked jealousy among the brothers so they plotted to sell Joseph to slavery. Joseph lands in jail after false accusations of a relationship with his master’s wife. While incarcerated, his talent for interpreting dreams drew interest from the Pharaoh who eventually ordered his release. Joseph saved Egypt from impending disaster after having predicted the seven-year famine based on the Pharaoh’s dreams. He earns the respect of the ruler, becoming his right-hand man of sorts. Joseph was able to reunite with his father and brothers in the end. Show is appropriate for all ages.